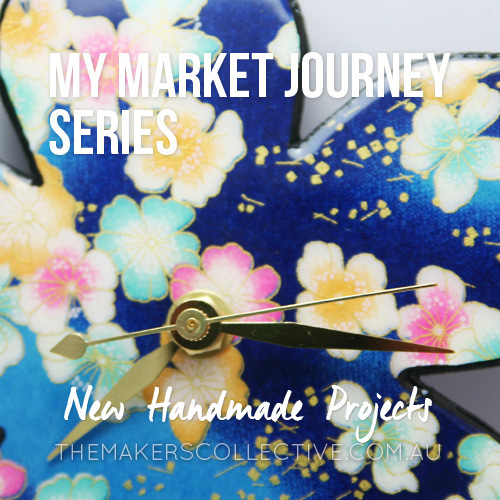 This is the third post in a blog series documenting my journey attending market stalls in Canberra, and talks about expanding my range for my market stalls in 2010. The only thing I miss about my time before becoming a mama and being self-employed, is having more time to just sit and create new things. Even with a full-time job, sporting commitments, and a social life, I still managed to have time to just tinker around with ideas. This was a big part of how my little business grew into it’s current form, and my products have come a LONG way since those first buttons at my stall in 2010. So keep tinkering, people! I’ve been working on a few ideas for Japanese inspired items to take to the next handmade markets along with my Yuzen Paper magnets and badges. I’ve created my first blossom clock, featuring the Yuzen paper with a resin coating, and also a cute little Kimono doll which I made for Katie’s birthday present. My friend from Work, Nelle, who has lived in Japan and is a Japanese languages teacher, is going to help me out to get the kimono wrap right… apparently the way I’ve done it at the moment means it’s dead! haha poor little doll. These were both really fun to make and I’m looking forward to making lots more to take to the markets in September. Are you starting out on your own market stall journey? Keep a diary of how it’s all going, you’ll love looking back on it in 5 years time!